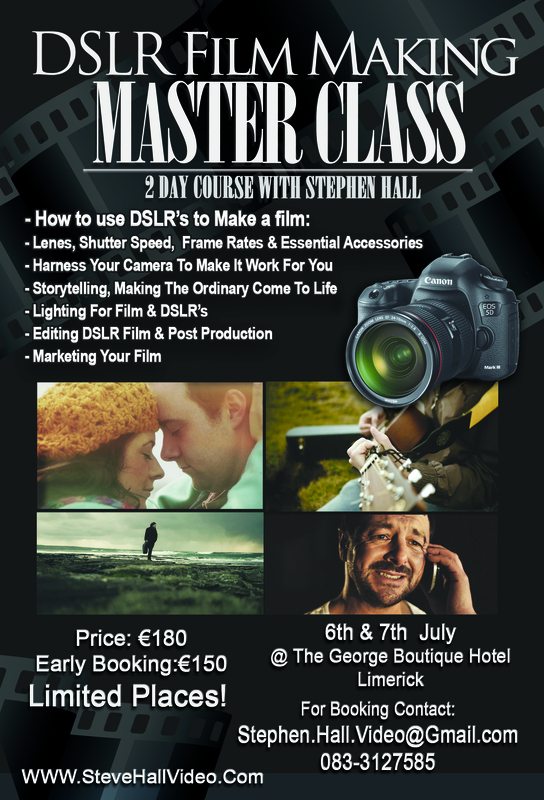 A Fantastic New 2 Day Course I’ll be running on the 6th & 7th of July at the George Boutique Hotel in Limerick. Over the two days it will be a complete training on how to, first of all use the camera correctly and to its fullest. Then i will cover some of the principals of indie film making, scripting, location hunting, getting actors etc. Lighting and camera kits, with live demo’s of crane/jibs, slider tracks and real gear to test out. Then handling the footage and editing it correctly through your editor. color grading DSLR footage, light VFX and Post work. Then of course what to do with your film once its finished. We will also have some real world shooting experience, we’re all going to go out and shoot some footage to play with in class.! Book Now to Secure Your Place! There is a limited number of places and are filling up fast!